- Maraca - Place a few dried beans or rice on the top of a paper or plastic plate. Lay another plate (with the top down) on top of the plate. Staple the sides together. 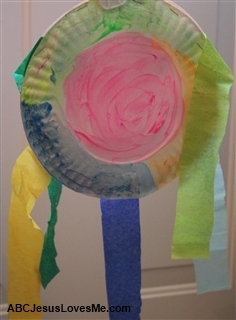 Decorate with streamers, yarn, stickers, etc. -or- Place dried beans in a plastic Easter egg. Tape shut. - Drum - Use an oatmeal container with the lid. Cover the sides and decorate. - Tamborine - Poke holes along the edge of a paper plate. Push the base of little "jingle" bells through the holes. String the bells underneath together with a piece of yarn. Decorate and add streamers. -or- Poke holes around the edge of a plastic bowl. Push the base of little "jingle" bells through the holes. Using pipecleaners, thread through the bell base and twist. Decorate. - Cymbals - Collect two metal lids (from baby food or other glass jars). Poke a hole in the middle of the lid using a hammer and a nail. Fold a pipecleaner (approximately 3" long) in half. Push the end through the hole and twist. Fold the ends so they are against the bottom of the lid. Have the child hold the pipecleaners and hit the lids together. - On the Star and Heart worksheet, paint each shape blue. Outline each shape by gluing on white cotton balls. - Play "I Spy" with colors and shapes. Teach the child to give a firm but not hard hand-shake when meeting a new person. No "spaghetti arms." - Go to the grocery store a look at all of the berry options available in your produce section. - Make up other nonsense "berry" words. - Eat berries; have a berry smoothie. - Make jam, berry pie, blueberry pancakes, strawberry muffins, raspberry cobbler. - Read other "berry" books - The Little Mouse, the Red Ripe Strawberry and the Big Hungry Bear or Blueberries for Sal (both on the 3 Year "Book of the Week" List). Using a tub or sink of water, play with a baster. Fill up cups and containers. Log roll on the ground or down a hill outside.